An all you can eat and mouth-watering assortment of warm and cold dishes await your arrival in Skagway. 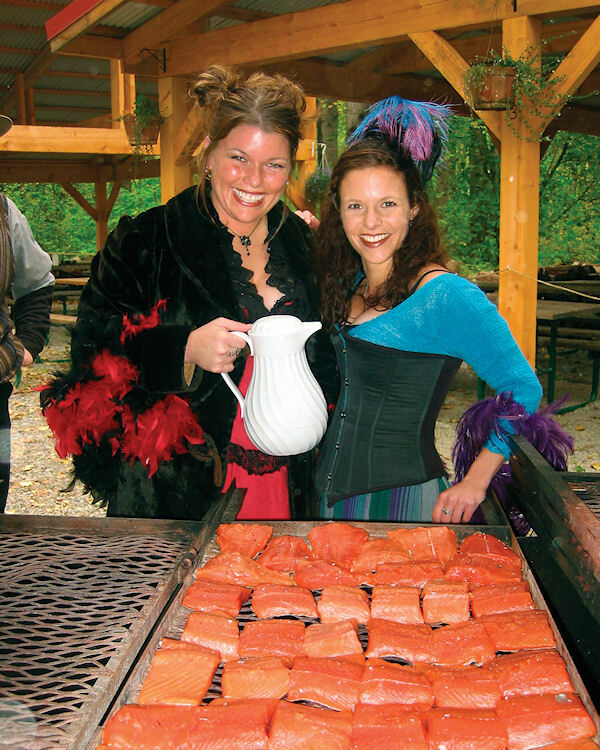 Savor Alaskan-caught wild salmon grilled over an open alder wood fire as part of this feast in the forest. Enjoy Chilkoot Chicken, Panners Pasta, Prospector Pete’s Reindeer Beans, Liarsville Rice Medley, Sluice Box Slaw and other fresh salads, plus cornbread and blueberry cake for dessert. (Beer and wine are available for purchase.) This delicious meal also includes a visit to an 1898 replica campsite located in the historic Liarsville region. While you partake in all of the modern conveniences and menu items from our century, take the time to reflect on how the prospectors of yesteryear survived. Converse with our colorful characters and gold-digging madams as you enjoy a glimpse back at life during the Klondike gold rush. Visit the Fancy Goods Gift Shop to find that special souvenir. Have your picture taken with our camp mascot, an Alaskan malemute named Denali. Don’t forget your camera so you can have your picture taken with one of the dance hall girls or the camp's lovable mascot, an Alaskan Malamute named Denali. Beer and wine are available for purchase. Some final notes: bring your vouchers and dress comfortably for the weather. Children 12 and under must be accompanied by an adult. Children ages 13-17 must have a signed parental consent form to participate in the absence of a parent or guardian.